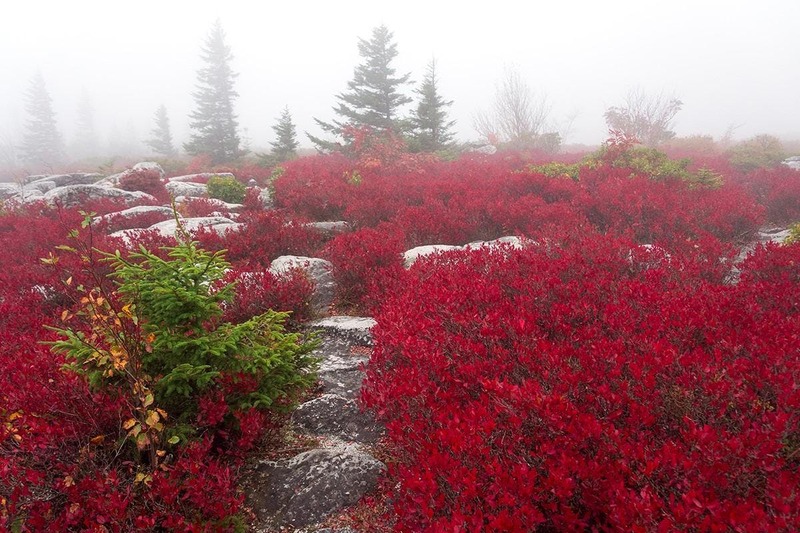 Dolly Sods: Here is a wilderness area more like Canada than West Virginia. There are sphagnum bogs with sundew and reindeer moss. The branches of red spruce trees grow only on one side because of strong prevailing winds. Blackwater Falls: These falls drop five stories and are among the most-photographed in the state. The falls may be viewed from above and below. The water gets its dark tone from tannic acid from hemlock and spruce needles. Seneca Rocks: These rocks, which rise nearly 900 feet above the North Fork River, are one of the best-known landmarks of West Virginia. Spruce Knob: At 4,863 feet above sea level, Spruce Knob is West Virginia’s highest mountain. This rugged alpine peak is an ideal place to view a sunset. Plan on arriving at our meeting location in West Virginia (to be sent to participants) by late afternoon Thursday, October 3, spending Friday, Saturday and Sunday morning in the field, then leaving after lunch on Sunday, October 6. Participants must be comfortable using their camera equipment and tripod. You will need a good pair of hiking shoes and lots of layers – dawn temperatures in the 30s can give way to mild afternoons. The fee does not include lodging, food, or transportation (carpooling is encouraged). Information on group lodging discounts will be available for participants by July 15. The trip is limited to 12 participants. Cancellation received 75 or more days prior to the workshop will receive a refund of the paid fee minus a $100 cancellation fee. Cancellation received 74 or fewer days prior to the workshop will not receive a refund unless you or CVPS find someone to fill your spot. In that case, you will receive a refund of the paid fee minus a $100 cancellation fee. In the event that a workshop is canceled by CVPS, all monies will be refunded. Every effort is made not to cancel an event, but we reserve the right to do so and we are not responsible for any losses you may incur due to a cancellation.